Since moving out West 5 years ago I have been a huge fan of southwestern flavors and cuisine! Taco Tuesday is, obviously, my favorite day of the week… I mean who doesn’t love tacos, Tuesday and delicious food. Well for this taco Tuesday I thought I would bring you my favorite new and super fresh, homemade southwestern ‘taco’ salad. This is the perfect week night side, it’s so fast and easy and the added bonus, everything is homemade! Everyone will think you slaved away for hours on fresh tortilla strips and taco ranch vinaigrette! As you can see above I used freshly grated Parmesan cheese, which makes all the difference! The taco ranch vinaigrette is my grandmother’s secret recipe, so I can’t actually tell you what’s in it but any kind of southwestern dressing will do. The tortilla strips are best when you sprinkle them over the salad fresh out of the oven like I did above! Toss everything together and garnish with a dollop of organic sour cream! Season to taste with freshly ground pepper and enjoy!! 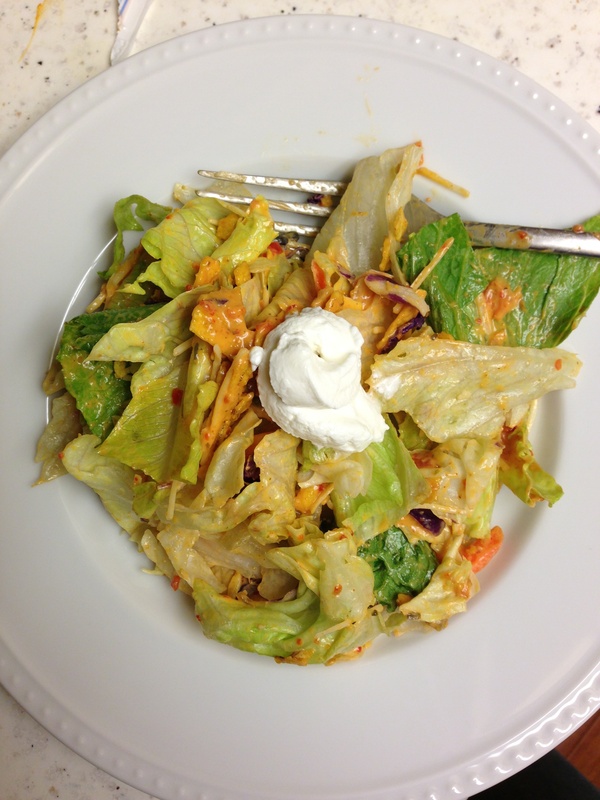 This entry was posted in Recipes, Salads and tagged salad, southwestern by skibootsinthekitchen. Bookmark the permalink. Good looking salad! I’ve committed to eating more of them myself. Nice to make your acquaintance!